Google Flights is a very powerful flight searching tool built by Google. It offers users the ability to easily search almost any airline, route, or trip with ease. Google Flights launched in 2011 and has had multiple revisions to keep it updated and working as efficiently as possible. 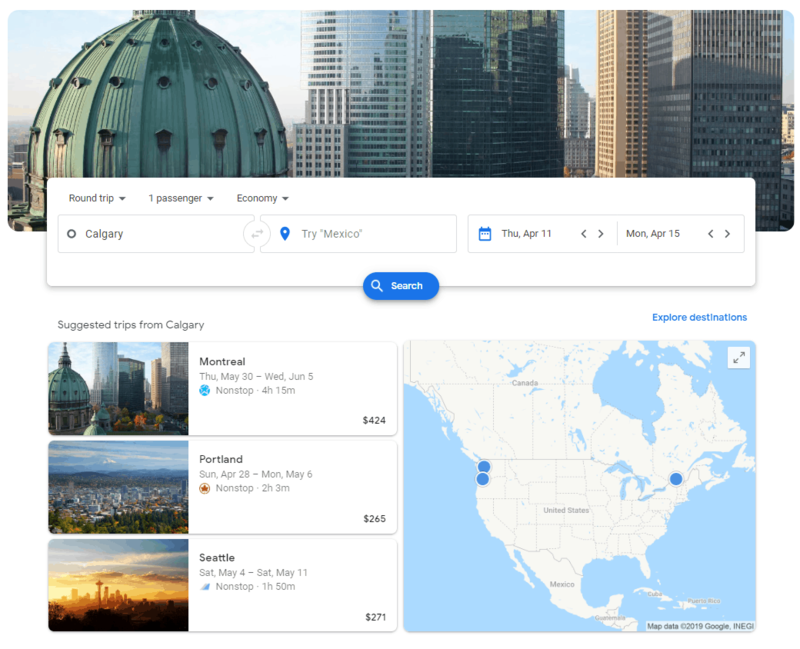 The most recent major updates were in early 2019, so we wanted to offer a guide for the latest 2019 Google Flights version to show you how we do a portion of our flight searching and make it easier for you to find great deals. Why do we recommend Google Flights? It is easy to learn and simple to navigate even for beginners. It allows you to search from multiple cities at a time. It is a great tool to learn how to find cheap flight deals. The Google Flights Explore map feature shows a map that gives the prices to many cities in a region. Google Flights won’t always give the cheapest price of a route. The Google Flights Explore map feature can take a bit of time to load the prices to some regions. A small portion of prices will sometimes show incorrectly, due to how Google Flights caches the data airlines provide. When starting your searching on Google Flights, you will notice a page that appears similar to the above picture. It should automatically populate the departure airport based on your location. This Google Flights homepage is fairly simple, all you have to do is enter in your departure city or cities in the first white text box (you may enter up to 7 cities at a time), where you would like to go in the next white text box (you may also enter up to 7 cities in this box), and then choose the dates that you would like to travel into the calendar. You can also change the number of passengers, class of the flight, and whether you want round trip flights, a one-way flight, or a multi-city trip right above the white text boxes. 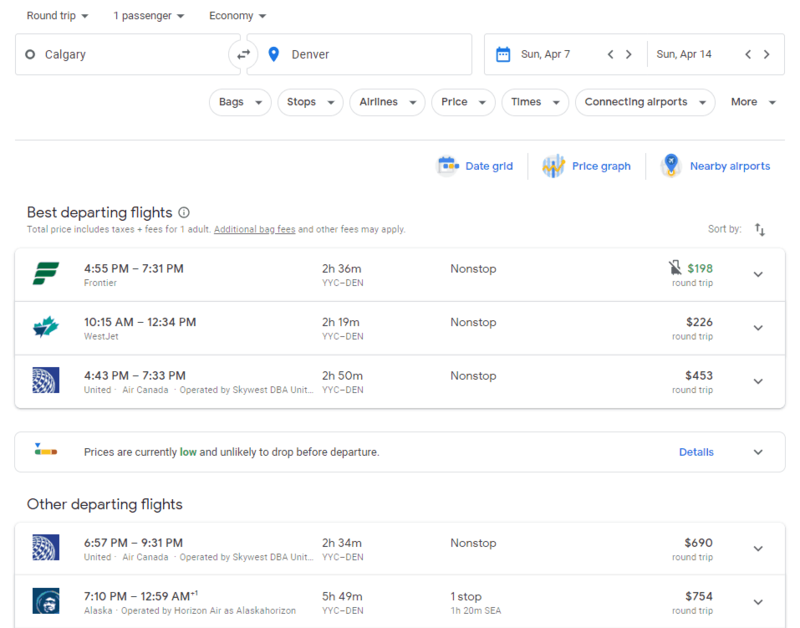 This page also shows a few suggested trips and includes the travel dates, airline logo, how many stops there will be, the duration of the flight, the price, and compares the price to the average price for that route. If you scroll all the way to the bottom, you will find settings for language, country, and currency. For this guide, I am using Calgary, Alberta, Canada as an example. Alberta is a great place to add to your bucket list because of the gorgeous mountain views, some amazing lakes, spectacular wildlife, as well as some big cities to explore. It is also a cheaper trip compared to flying over to Europe, so it is a great stepping stone if you are just starting out your traveling adventures. One of the most useful features for finding cheap flights on Google Flights is the Explore destinations tool. The Google Flights Explore map feature allows you to select up to 7 departure cities and then scroll around the world to see the best prices Google Flights can find to almost any location. You can access this feature easily by clicking the “Explore destinations” below the dates on Google.com/flights. Alternatively, the Explore map can be accessed by clicking the menu button in the top left corner, which looked like three stacked lines, then clicking “Explore map”. You will then see a large map with a selection of various cities and the pricing of a flight for the dates you have selected. You can scroll around this map with ease and it will continue to update the results, as long as the button that states “Update results when map moves” in the bottom left corner of the map is turned on. Sometimes, if you are looking for a particular city, you might have to zoom into the map more, because when the map is zoomed out it will only show the most popular results, but as you zoom in, it will show more results. In the top left corner of the Google Flights Explore map, you have the opportunity to change the same options as the initial Google.com/flights page. As well as the options that were included on the Google Flights homepage, you can also find one of the most useful options on this menu by selecting one of the date boxes below the departure city and the “Where to?” box, then selecting flexible dates at the top of this new box. This will now adjust the travel dates individually for each city. This is based on the cheapest available dates within the time frame you have set in the flexible dates' menu. Using the Explore map on Google Flights is quite simple, all you have to do is input the options you want in the top left, then you can start scrolling around to see the best prices Google Flights has available. To scroll around the map, click and hold the mouse button and drag the opposite direction of where you want the map to go. 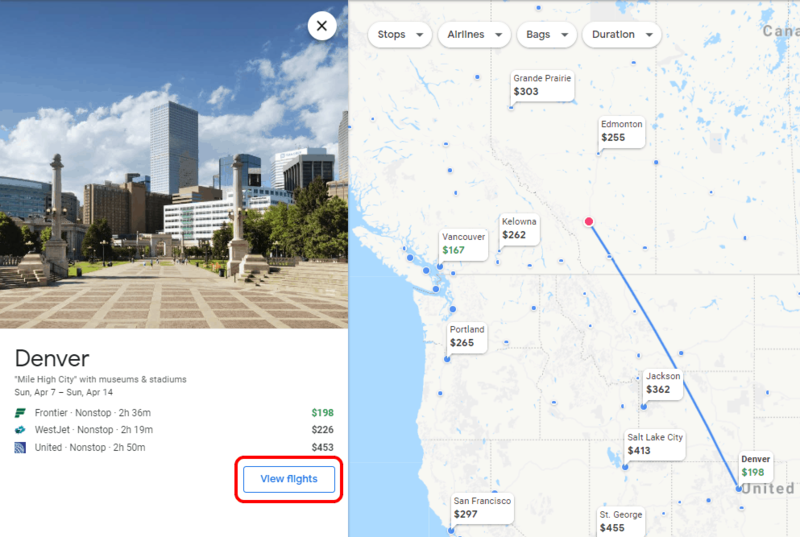 You can zoom in to show more cities and when you find a price you like, you can either click on the location bubble which includes the name of the city and the price or select the city from the list on the left-hand side then click the button saying “View flights” in the left-side panel. This will bring you to the itinerary selection screen shown below. The itinerary selection screen has a few different sections. The first is the very top bar, where you will find the same options that have been on the homepage and Google Flights Explore map and a new group of filters. Below this, you will see buttons for a date grid, price graph, and nearby airports. These can be useful if you are very flexible in your travel plans. The final portion is the most important, this portion includes all of the flight itineraries for the selected dates. This page will give you all of the information available for this flight, including the airlines, the time the flight or flight leg departs and lands, the airport codes, the number of layovers, the duration of the layovers, and the price. Some of this information might be found by expanding an individual flight card by clicking the arrow on the far right side of the card. You will first choose a departing flight, then you will be able to select the returning flight. Google Flights offers the ability to filter out certain itineraries, so you won't be stuck with a 36-minute layover in Atlanta. Another benefit of the ability to filter is that you can use layovers to your advantage; one of our staff members at CheapFlightClub.com has family in Orlando, so they will intentionally try to get long layovers in Orlando to make a mini-trip to visit family for no additional cost. There are two places that these filters can be applied. The first place the filters can be applied is directly on the Google Flights Explore map at the upper left corner of the map. From here, you can set a maximum amount of layovers you want, the airline alliances you are shown, how many bags you would be taking, and the maximum duration of a flight leg you want. The second place you are able to adjust the filters is on the flight itinerary screen shown after selecting a city. Within this flight itinerary screen, you have more ability to customize how your flights are filtered; you are able to set how many bags you will be bringing, how many layovers you want maximum, what airlines you would like to fly with, the price of the flight, what time the departure and return flights leave at, which connecting airports you want, the flight duration, and if you are okay with booking separate tickets to get a potentially lower price. Once you have selected a route you would like to take and added the filters you want, you can finally start looking at the prices for the flights you want to take. One of the most useful tools for finding the prices of flights is the two-month calendar that can be opened by clicking on the dates while on the itinerary screen. There are two useful pieces of information to know about the calendar for effective use. 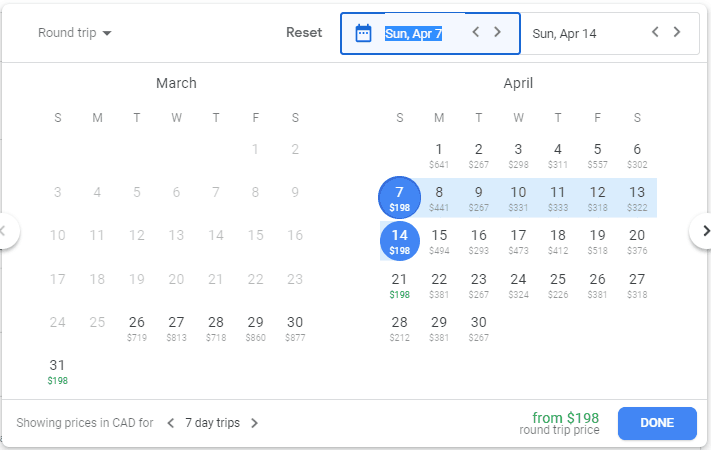 When you first open the calendar, you should see an option at the bottom left of the box to change the number of days for your trip, notice that this changes many of the date's prices. Often times, selecting a few dates and checking the prices can be useful to see the prices you should expect. We always add or remove a few days from the trip to see how the price is affected. Usually, we try to find trips between five and ten days long because we find that gives the best deals. Sometimes international trips require a minimum stay of seven nights for the best deal, so we recommend searching between eight and ten days. Trips longer than ten days also give good deals if you are wanting a longer trip. Once you select a date on the calendar, you will notice that all the following numbers change. When you select a date, you are setting your departure date and the map then conforms to that departure date and the price for each of the following days will be the round-trip cost if you end your trip on a specific day. Now to create your itinerary, you will start at the flight itinerary page. A lot of selecting flights comes down to personal preference, however, there are some things that can are important to note. When checking itineraries and booking flights on Google Flights, we avoid using ultra low-cost carriers (ULCC) like Spirit, WOW Airlines (this airline is defunct as of March 28, 2019), Frontier, and a few more. The reason we avoid these carriers is that quite often, the price you see on the itinerary will be only a portion of what you have to pay. These carriers sell cheap tickets but charge for many things that most airlines wouldn’t, like a carry-on bag or small in-flight snacks, and are far less comfortable than most other airlines, because their goal is to have the cheapest overall ticket cost by cutting their conveniences and amenities down. We recommend finding flights with a personally trusted airline, as they will often provide the best experience for you. If there isn’t an option to book with your favorite airline, try to book another airline you have heard of. If you haven't heard of an airline and are unsure of the quality, you can check a couple of ways. You can check to see if they are part of an airline alliance or check reviews. If you have an airline that you prefer, check what airline alliance they are in and stay within that alliance. Many alliances and partners allow rewards points to be earned for partnering airlines and might even offer some of the benefits of a frequent flyer program you are already a part of on other airlines. 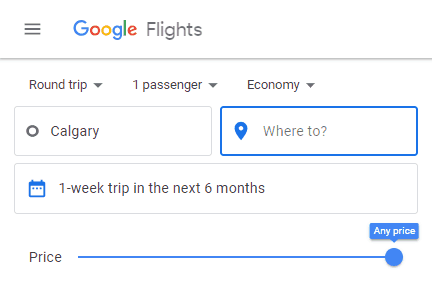 Another advantage Google Flights offers is the ability to receive notifications for a specific trip's pricing. Follow the instructions to turn on email notifications for price alerts on a specific route. First, make sure you are signed in to a Google account. Then, select the route you want to be notified about. Finally, just click on the button called “Save and track price” located by the "Share" and "Send to yourself" buttons on the itinerary screen. Google Flights will only track the prices for the dates selected. You can turn on notifications for up to 100 different trips on Google Flights. Google Flights will occasionally get the prices wrong for some flights, many times this is because of what we call "phantom fares" or "ghost fares". These phantom fares can be caused either as a result of how Google caches the data for Google Flights or because of faulty information received from online travel agencies or airlines. For more information on phantom fares, click Here.